1. Preheat the oven to 220°C, gas mark 7. Grease a shallow ovenproof dish (approx 24cm square) with a little butter. Melt 20g of butter in a saucepan and add the panko breadcrumbs. Stir until coated and set aside. Cook and drain the macaroni according to the pack instructions. 2. In a large saucepan, melt the remaining 80g butter. When foaming, add the flour and stir over a low heat until it forms a thick paste. Cook the mixture over a low heat for a minute or two before gradually adding the milk, whisking between additions. When all the milk has been incorporated, bring to the boil while stirring, then simmer gently for 1 minute to thicken. Take off the heat and add the cooked pasta, mustard, Cheddar, salt and nutmeg. 3. Pour into the prepared dish. Top evenly with the crab meat and cover with the golden breadcrumbs. Cook for 10 minutes, or until the top is crunchy and golden. 4. While the macaroni is baking, make the salad dressing by whisking together the lemon zest and juice, vinegar, olive oil and 2 tsp of water. Season. Toss together the lettuce with the herbs and a little of the dressing. 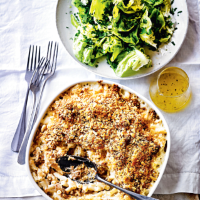 Serve alongside the hot mac’n’cheese with the extra dressing to drizzle if you like.